Who has prepared the Draft Recovery Plan? The Draft Recovery Plan has been prepared by the Waimakariri District Council working closely with Department of the Prime Minister and Cabinet, Environment Canterbury, Te Rūnanga o Ngāi Tahu and Te Ngāi Tūāhuriri Rūnanga, taking into account community feedback over the last 18 months and technical investigations over the last two years. The government has not yet formally considered this Draft Recovery Plan, and will not do so until the views of the community are known and have been considered by the Minister supporting Greater Christchurch Regeneration (GCR). What is a Regeneration Area? We think it is time to move away from the term ‘red zone’. In the Recovery Plan the areas in Kaiapoi, The Pines Beach and Kairaki, which were zoned red after the Canterbury earthquakes, have been called the Regeneration Areas. There are five regeneration areas in the Recovery Plan: Kaiapoi West, Kaiapoi East, Kaiapoi South, The Pines Beach, and Kairaki. What does approving the Recovery Plan mean for Kaiapoi, The Pines Beach and Kairaki? The approval of the Recovery Plan is an important step in the regeneration of these areas. It provides some certainty over the future land uses and activities. It is also is a key step towards enabling the Council to complete repairs to damaged infrastructure (roads and services). The next phase is the implementation of the Recovery Plan. This means putting in place the new land uses and activities (such as the new road links, walking and cycling paths, green spaces, business and rural activities). Can I buy back my land to build a house on? No, the Recovery Plan does not include any provision for residential development in the regeneration areas. What was the process for preparing the Recovery Plan? The process that was used to prepare the Recovery Plan is set out in the diagram below. 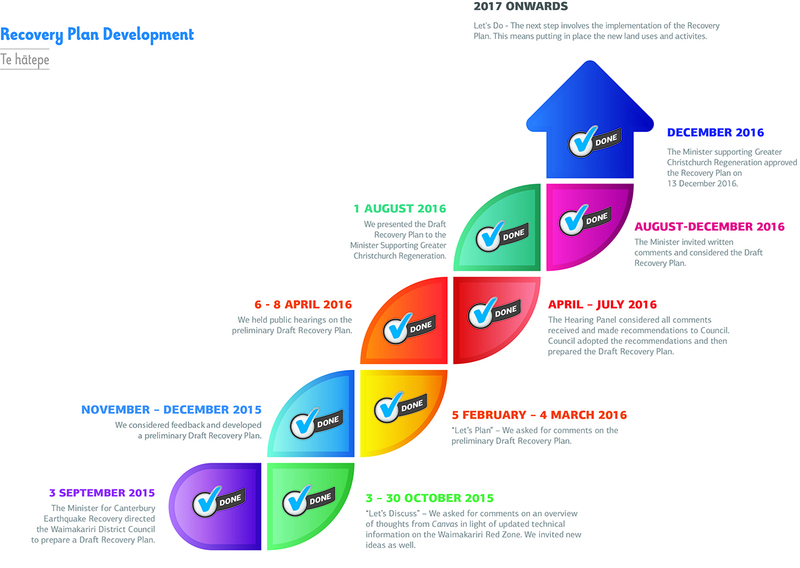 What are the key changes between the Draft Recovery Plan and the approved Recovery Plan? There is no reference to residential development in the Recovery Plan, this includes the mixed-use business areas and rural areas. The regeneration area at Kairaki is proposed to be divested to the Te Kōhaka o Tῡhaitara Trust to be managed in accordance with the Tῡhaitara Coastal Park Reserve Management Plan. The specific location for the motor caravan park and car parking provided in the Kaiapoi East Regeneration Area has been removed. These activities are still proposed within the mixed-use business area and specific locations will be determined during the implementation of the Recovery Plan. The Crown has given agreement in principle to divest (transfer) the majority of the Crown-owned residential red zone land in the Waimakariri District to the Council and a small portion to Te Kōhaka o Tῡhaitara Trust. The Recovery Plan also looks different to the draft. It sets out the process involved in developing the Recovery Plan, the decisions made on the Recovery Plan and the next steps for implementation, including who will implement the key land uses. Who will implement the Recovery Plan? Council, working with Kaiapoi-Tuahiwi Community Board, will lead the implementation of the Recovery Plan. We will work with our key partners; the Crown, Te Rῡnanga o Ngāi Tahu, Te Ngāi Tῡāhuriri Rῡnanga, Environment Canterbury, resident and community groups and the community. When will you start to implement the Recovery Plan? Before Council can start implementing the Recovery Plan we need to work with the Crown to determine how the regeneration areas will be transferred to Council and the Te Kōhaka o Tῡhaitara Trust. This is called the land divestment process. While this is occurring more detailed planning will be underway. We will be working with the Crown in early 2017 on the land divestment process. Land divestment is the process of disposing of Crown-owned properties such as those purchased by the Crown in the regeneration areas. For the regeneration areas this involves transferring Crown-owned land to the Council and the Te Kōhaka o Tῡhaitara Trust. When will the Crown transfer the regeneration area land to Council? In the Recovery Plan the Crown has agreed in principle to divest (transfer) the Crown-owned land within the five regeneration areas to Council and Te Kōhaka o Tῡhaitara Trust. This is on the understanding that the land uses and activities in the Recovery Plan will be implemented. In early 2017 we will work with the Crown to develop a framework for land divestment. How long will it take to implement the Recovery Plan? The timeframe for the implementation of the Recovery Plan projects varies. Some projects can be done in the short to medium term (in the first one to five years); others will take longer (out to thirty years). What projects will Council start first? We are working on a timeline and schedule for the Recovery Plan projects. This will be dependent on the land divestment process and when the regeneration areas are transferred to Council. This timeline and schedule will be released in early 2017. It is likely that the first projects will focus on completing the repairs to damaged infrastructure (roads and services) within the regeneration areas. Can I be involved in the implementation of the Recovery Plan? Yes, there will be the need for the community to be involved in the design and planning of the Regeneration Areas, particularly the new green spaces. There will also be opportunities for the community to work with Council on some projects in the regeneration areas; for example edible landscapes (food forests) and native revegetation. One of the first tasks we will be working on is the development of a Participation Strategy. This will outline how the community can be involved in the implementation of the Recovery Plan. How can I keep up to date on what is happening in the Regeneration Areas? The best way to keep up to date is to check the Council website. We will put all information up here. We will also use our Facebook page as well the newspaper, newsletters and signs. What is all this going to cost and how will it be funded? Council has $6 million dollars budgeted to implement the new green spaces in the Recovery Plan. This will not cover all of the green space projects within the Recovery Plan. To implement all the proposals in the Plan would require around another $10 million to fully implement over what could be 20 years and beyond. In the future additional funding will be sought through Council’s Long Term Plan process, and as always this provides for public participation before funding decisions are made by the Council. There is also the opportunity for Council to explore alternative funding sources to help implement some of the projects in the regeneration areas. What does the Recovery Plan mean for private property owners in the Regeneration Areas? Council recognises that there are some private property owners in the regeneration areas. The Recovery Plan respects the rights of these property owners to legal road access and water services. Council will work with these property owners when designing and planning Recovery Plan projects. The Recovery Plan is a key step towards providing greater certainty for private property owners about what might happen in their neighbourhood in the future, and towards enabling the Council to complete repairs to damaged infrastructure. I live near the regeneration areas, what effect does this plan have on me? The Plan identifies recreation and ecological linkages and new roads, which together act as linkages and buffers between the existing residential areas and the proposed new sport and recreation reserves, the proposed memorial gardens and some of the proposed rural areas. These buffers will help avoid adverse effects from new proposed activities in the regeneration areas. I would like to purchase/lease land to set up a business/construct a building in part of the Regeneration Area – what do I need to do? At this stage it is too early to confirm the process for leasing or selling land in the regeneration area as the Council does not yet manage the land. It is still owned by the Crown. We will be able to provide more information after we have worked with the Crown on the land divestment process. Any purchase or lease of land and any activities will need to be consistent with the land uses defined in the Recovery Plan. What land uses are proposed in the regeneration areas? There are three general land uses proposed for the regeneration areas: mixed-use business, green space, and rural. The green space land use includes sport and recreation reserve, heritage and mahinga kai, recreation and ecological linkages, a memorial garden (ashes-only cemetery) and Tῡhaitara Coastal Park. There is also some land proposed for private lease at The Pines Beach. This will be for low-intensity uses and non-permanent structures. What does mixed-use business mean? Mixed-use business areas are proposed in the Kaiapoi West, Kaiapoi East and Kaiapoi South regeneration areas. Mixed-used business activities could include commercial and retail developments, car parking, a motor caravan park (in Kaiapoi East), and a transport interchange (in Kaiapoi South). Activities in the mixed-use business areas would need to appropriately address natural hazards, and support the Kaiapoi Town Centre. Do the proposed mixed-use business areas fit with the Kaiapoi Town Centre Strategy? Yes, the areas proposed for mixed-business activities are those areas closest to the existing Kaiapoi Town Centre. The need for additional business land in Kaiapoi was supported by the technical reports that informed the Recovery Plan. One of the first implementation actions of the Recovery Plan is a review and refresh of the current Town Centre Strategy (developed after the earthquakes). This review will also look at the new mixed-use business areas and how these would work with the existing town centre. The motor caravan park and parking area are no longer shown on the Recovery Plan maps, are they not happening? It is still proposed to explore the location of a motor caravan park and car parking (including boat trailer parking) in Kaiapoi East. By not identifying the exact locations on the map it gives the Council some flexibility in locating these activities. Has the Te Kōhaka o Tῡhaitara Trust said what they will do with the land proposed to be amalgamated into the Tῡhaitara Coastal Park? The Recovery Plan requires that the land to be managed under the Tῡhaitara Coastal Park Reserve Management Plan. The Recovery Plan requires the Reserve Management Plan to be amended, in consultation with the community, to include the proposed new area. The Recovery Plan also requires the Trust to actively seek funding to implement land uses. I see that there is potential private lease of some land at The Pines Beach. Can anyone lease this land or is it exclusively for those who lived there? The lease of this land will not be exclusive. The land can potentially be leased to anyone. There will be conditions attached to the lease, which are yet to be determined. Will there be public access to the Heritage and Mahinga Kai Area in Kaiapoi South? Yes, there will be public access through and around this area. The Heritage and Mahinga Kai area is intended to provide space for cultural and social activities for the community. When will Courtenay Drive be permanently repaired? Now that the Recovery Plan has been approved we can finalise the design for the permanent repair of Courtenay Drive, Charters Street and Wyber Place. The road will be rebuilt in its current position but there will be changes to the design of the road. The majority of the rebuilt road will not have kerb and channel as it is now more rural in nature and will have grassed swales for stormwater control. It will also have traffic calming features to manage traffic speeds and provide safe and convenient pedestrian crossing points. The plan is still being finalised and will be made available shortly. It is planned to start road construction in the latter half of 2017, following the sewer replacement work, and be completed by the end of 2017. When will the new link between Feldwick Drive and Bracebridge Street go in? Now that the Recovery Plan has been approved we can start the design of the new road link and because this is on a new alignment, there is much to do to develop the design. The construction of the new road link is dependent on the land divestment process and the transfer of the land to Council. This new road link is an important regeneration area project that we would like to progress in the short-term. What will happen in the rural areas? Rural activities could include agriculture, pastoral farming, and/or horticulture. The rural zoning will include setback buffers and restrictions on the types of activities in the rural areas. These restrictions will help to prevent intensive farming (such as poultry farms) and other activities that have the potential to create adverse impacts on surrounding neighbourhoods. The rural areas will also house infrastructure such as pump stations and a stormwater management area. Will the Askeaton Park boat ramp still be open? Yes, you can still use the Askeaton Park boat ramp. What will happen to the existing trees and plants? At this stage Council has no plans to remove any trees or plants. Until the land divestment process is complete the Crown still owns and manages the land in the regeneration areas. When we start doing the detailed design for Recovery Plan projects (for example the dog park or BMX track) we will try to keep the existing trees and plants where we can. What happened to the comments I made on the Preliminary Draft Recovery Plan? The feedback and comments made on the Preliminary Draft Recovery Plan were considered by a hearing panel in April 2016. The hearing panel included Mayor Ayers, Councillor Atkinson and two independent members. The panel made recommendations on the comments and Council accepted these recommendations on the 5 July 2016. These recommendations became part of the Draft Recovery Plan submitted to the Minister on the 1 August 2016.